In 2008, Lynn Camp Prong, a stream in the Great Smoky Mountains National Park was closed to fishing to restore native Southern Appalachian Brook Trout to their home water. Like the ‘brookies,’ I have always considered it my home water. It has always been a favorite place for our family and only a short drive from our home in Townsend, Tennessee. The end of the gravel road where the trail follows the stream is the place we love to fish, hike and play as a family. 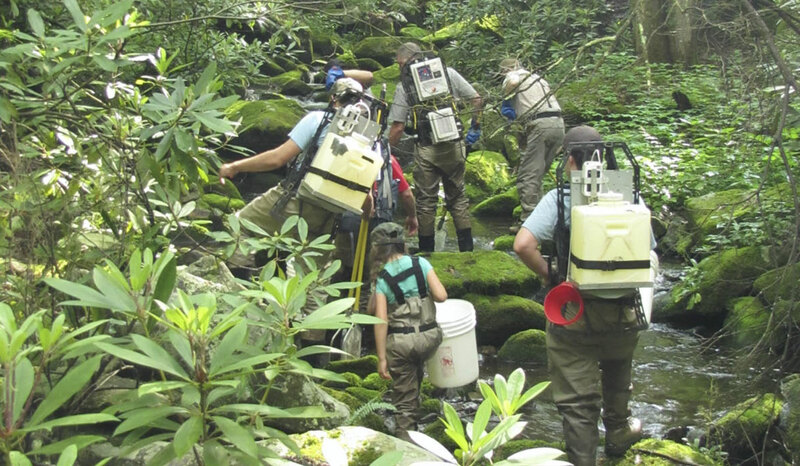 Throughout the past seven years, we have actively volunteered on this project led by fisheries biologists in the Great Smoky Mountains National Park. Involving my children in a volunteer project is important to me for many reasons. My husband Ian and I are full time fly fishing guides and own a fly fishing guide service. We want to share our passion with our children and hope to instill in them a respect for our rivers, woods and public lands. 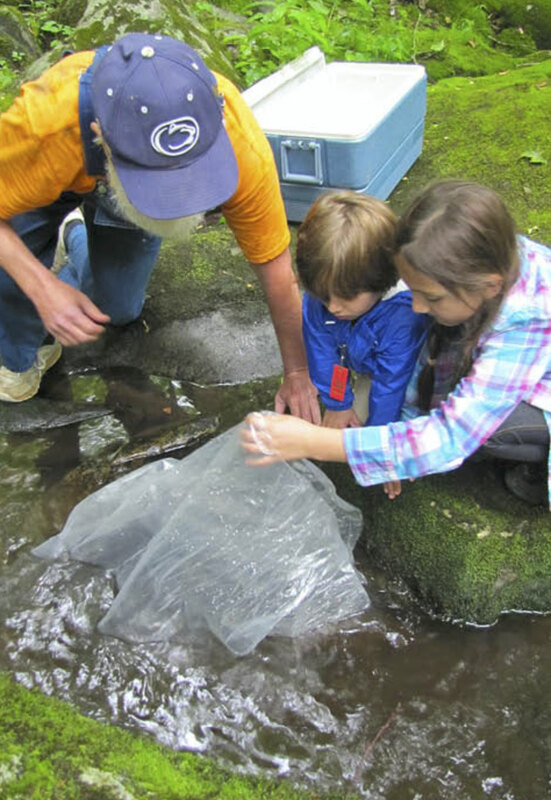 As you might expect, it is no simple task to take two young kids along on a full day of work in a stream with biologists, but the rewards are well worth it. The experiences we gain together as a family are priceless. It is hard to put into words the feelings I have after a day like this with my children. 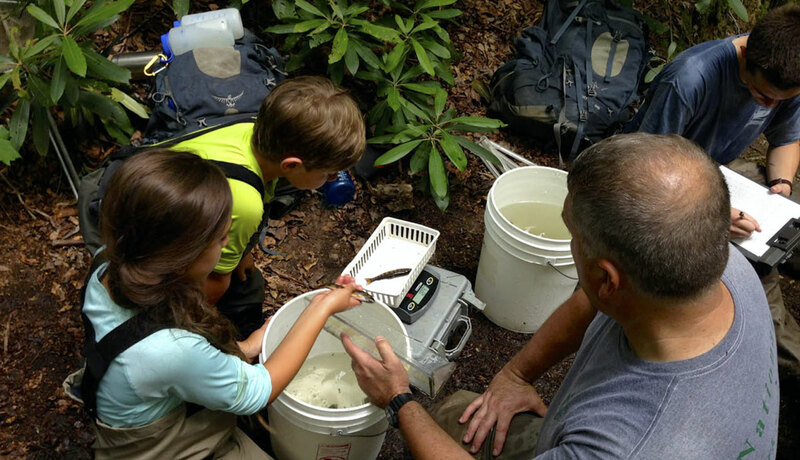 In May of 2014, I took my children, aged 9 and aged 4, out with the Great Smoky Mountains National Park Fisheries crew on a day that was critical to the success of the Lynn Camp Prong restoration. We had been on several volunteer projects with the park service biologists in the past, but this one was different. We were going to help the biologists collect Brook Trout from that stream to transplant into our home water. We packed our lunch and rain jackets, put on our waders and wading boots and hiked about 1-1/2 miles to a wild Brook Trout stream called Tom’s Creek near Cosby, Tennessee. Most hiking guide books would rate it an easy walk, but it was hard work for the kids. They took about two steps to every one of mine. The air was thick with humidity. Once we arrived at the stream, my daughter jumped right in the creek with the biologists as they fired up electro-shockers and began collecting Brook Trout. She was tiny in stature compared to the adults, but she was mighty in spirit, climbing over boulders and cascades with her big white bucket. Others around her placed captured trout in her bucket. My son and I stayed along the banks of the river to set up a work station. We had to gather buckets of water from the stream, set up mesh cages and set up the scale and ruler board for recording exact measurements. He was very serious about his job of collecting medium sized rocks to place in the mesh cages so they would not float away. He worked diligently to make a nice temporary space for the Brook Trout. After his job was done, he took some time to seek out Caddis larva and Stonefly nymphs in the river. 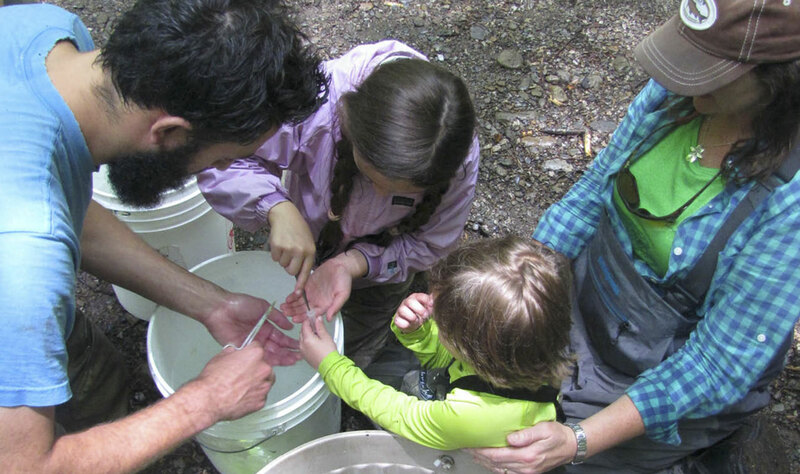 It’s common to get a Salamander or Crawdad in the mix when shocking streams and the kids were quick to clear them out of the buckets of Brook Trout to gently place them back in the stream. All three of us worked side-by-side with the team of fisheries biologists and other volunteers. We collected DNA samples by clipping the adipose fin from 50 of the trout we were moving. The sample was then placed in a small numbered test tube. It was fun to watch the kids with their tiny hands holding the test tubes and using tweezers to transfer the clipped fin to the security of the container. Once the samples were collected and secured, we began the process of moving the ‘brookies’ to their new home. The fish were weighed, measured and counted. 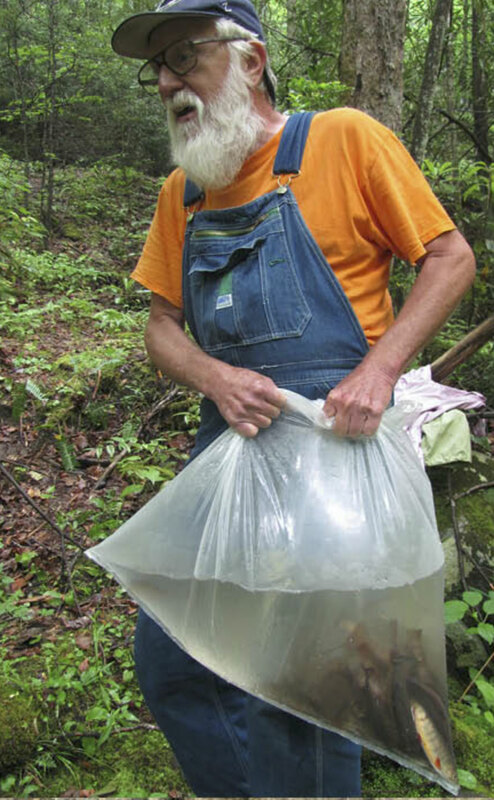 The biologists kept a portion of the trout to transfer to Lynn Camp Prong and returned the rest of them to Tom’s Creek. I know they have pride and a sense of ownership in the stream and the native trout that live there. Tennessee Wildlife Resources Agency (TWRA) biologists provided a cold water truck to transfer the fish to the trailhead at Lynn Camp Prong, nearly an hour and a half drive away. We gently loaded the Brook Trout into the fish tank backpacks and carried them to the trailhead where TWRA biologists were waiting for us. The kids were a little nervous about putting the Brook Trout in that big truck, but we assured them the cold, bubbly water was just what they needed to keep them safe as we moved them to their new home. We grabbed a snack from the cooler in the back of our car, took off our wet gear and headed back across the National Park to the Tremont area and Lynn Camp Prong trail. We arrived at the trailhead about 30 minutes before the slower hatchery truck and took advantage of our head start to hike in to one spot where the trout would be released. We waited with anticipation. My son jumped up and down with his arms high up in the air cheering as the ATV driven by park biologists came up the trail carrying the Brook Trout for release. We were at one of the two locations to release trout and there were two large bags filled with water that each held about 100 Brook Trout. We put the bags in the river so the trout could acclimate to the temperature of the water in their new home. They were able to release one bag each and of course they helped each other. There were other volunteers helping us as well. It was a beautiful sight to see all those brightly colored Brook Trout swim out into the stream. They went every direction; some under boulders, others to a gravel bar to hold under overhanging Rhododendron branches. All the while, The kids provided encouragement. “Go ahead little buddy, don’t be scared. You’re alright. This is your new home! Isn’t if beautiful? We love it here. 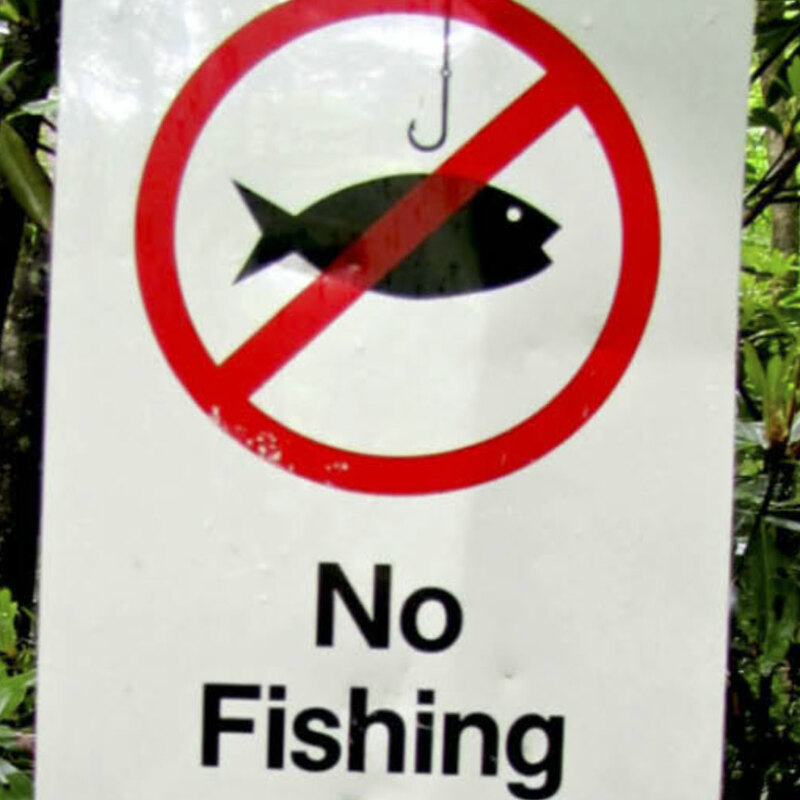 We hope you will too.” I am happy to report the fish populations in Lynn Camp Prong have grown in abundance and the national park released an announcement to open the stream for fishing on February 28, 2015. She was eager to know how they were doing and how much they had grown since she had her hands on them in Tom’s Creek. We started in the river with the biologists monitoring the stream and we set up the work station along the banks of the river. As we made our way up the river bank back to the work station, my daughter grabbed my hand and pulled me back. “Look out!” and I jumped back thinking I was about to step on a timber rattlesnake! “Chanterelles!” she announced and pointed to the ground right in front of us. We gently broke the stems off the mushrooms and filled her cap with her find. She was so excited to show everyone the treasure she had found. The mushrooms were a bonus find along the way that added nicely to our dinner that night! Once the buckets of trout started coming in, the kids were right in the middle of the action, carefully pulling the trout one at a time from the bucket and putting them on the board for measuring and reading off the weight from the scale to the college intern who recorded the data. It made me proud to see the kids so involved in the entire process and to see how well the fisheries crew and volunteers accepted their help and encouraged their understanding of the world around them. When we got a chance to fish Lynn Camp Prong for the first time, wouldn’t you know my daughter’s first catch was a beautiful Brook Trout with a clipped adipose fin. My husband took this picture of her holding that ‘brookie’ and I shared it in an email with the head fisheries biologist whom we had volunteered with every step of the way. As a fly fishing guide in East Tennessee and the Great Smoky Mountains National Park, I feel it is my responsibility to be an ambassador of the rivers and streams. As a parent, I feel it is my responsibility to teach my children how to become ambassadors of our environment and instill in them a passion to protect our natural resources. My hope is that if we share our passion for the environment with those around us, then they too will become passionate about protecting and preserving it.